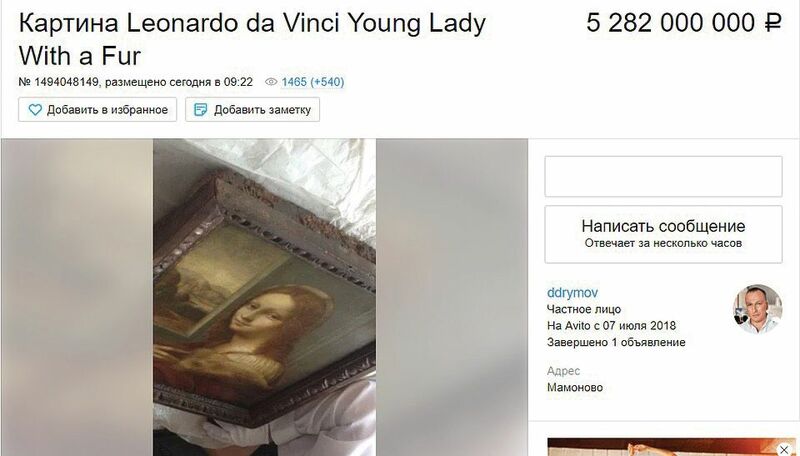 A Russian man who advertised a “genuine” work by Leonardo da Vinci on Avito (a Russian classified ads site similar to eBay) for more than €72m says that he has found a buyer. “Dmitry”, from the town of Mamonovo in the Kaliningrad region, says that the painting, titled A Young Girl in Furs, was authenticated by the Stockholm art valuation firm Atelje Catellani. He posted photos of the accompanying documentation alongside the painting on 1 August. He refused to explain how he came to own the work, why it is in Germany and who the buyer is. A spokesman for Atelje Catellani says: “There is nobody entitled to offer the painting. A mandate does not exist; nobody has access to the painting.” The email went on to say that the firm was not entitled to share any further information. Da Vinci’s Salvator Mundi became the world’s most expensive painting when it sold for $450m at Christie’s in New York in 2017. Dmitry’s only other ads on Avito—offering materials for project management professional certification and a set of e-books—have now expired.